Gerty Guinea Pig Scrummies with Apple, Strawberry, Apricot and Banana are tasty baked treats fresh from our bakery, made with the wholesome goodness of natural grains and real fruit. 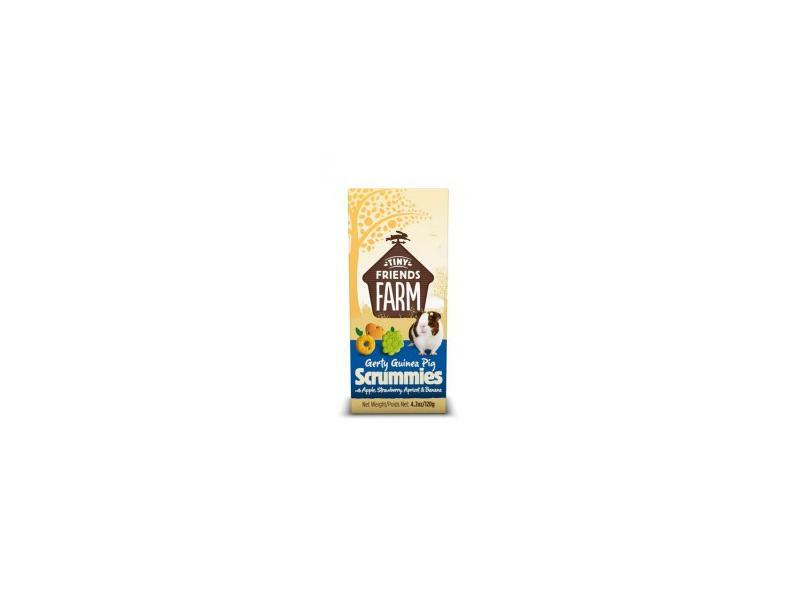 Gerty Guinea Pig Scrummies are perfect when you want to give your pet a tasty treat. They can be carefully hand fed to your pets, helping you to build those special moments together. One or two can also be hidden around your pet’s enclosure to encourage natural foraging. And remember to give your guinea pigs lots and lots of fresh hay every day! Gerty Guinea Pig Scrummies are also suitable for rabbits, chinchillas, hamsters, gerbils, mice and rats. Flour, oats, vegetable oil, sugar, apples (min 2.5% in green biscuit), apples and blackberries (min 3.5% in pink biscuit), apricots (min 1.5% in orange biscuit), EC permitted colours. Flour, oats, vegetable oil, sugar, apples (min 2.5% in green biscuit), cranberries (min 2% in pink biscuit), hazelnuts, blackberries, coloured with EC additives. There are currently no questions for Supreme Tiny Friends Farm Gerty's Scrummies - be the first to ask one!